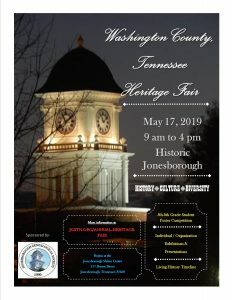 The Washington County Heritage Fair, a three-part heritage event that is open to the public, but specifically targets Washington County, Tennessee students through local heritage engagements that brings together local cultural and heritage organizations and sites to showcase local heritage and culture, will take place in Historic Jonesborough, Tennessee on Friday, May 17, 2019, and include three parts: 1. 5th-8th Grade Student Heritage Poster Competition, 2. Individual/Organization Exhibitions, and 3. Living History Timeline. From 9 am to 4 pm, the Washington County Heritage Fair will begin in Tennessee’s oldest town. Residents and visitors are asked to begin the day at the Jonesborough Visitors Center and Emporium, 117 Boone Street, Jonesborough, where participants can register and pickup a program of the day’s events. In addition, the 5th-8th Grade Student Heritage Poster Competition and the Individual/Organization Exhibitions will be displayed in the auditorium and classroom. The 5th-8th Grade Student Heritage Poster Competition brings together 70 area students from Washington County, Tennessee public and private schools at the Jonesborough Visitors Center and Emporium through a combined learning experiences where students’ knowledge of local heritage and culture are presented in a unique and creative way through the use of primary and secondary source material displayed on a tri-fold board in three specific categories. Each project will be judged by judicial panel that have experiences and interests in the specific categories. Winners will be selected by grade and category and announced during an Award Ceremony at 2 pm in the Visitors Center Auditorium. In addition, the winner of Best in Show’s teacher will receive a $500 cash prize from several organizations including the Jonesborough Genealogical Society, John Sevier-Sarah Hawkins Chapter of the Daughters of the American Revolution, Boones Creek Historical Trust, and the Fort Watauga Chapter of the Children of the American Revolution. The Individual/Organization Exhibitions bring together over 20 local heritage and cultural organizations and sites in the Historic Jonesborough Visitors Center and Emporium, which gives participants an opportunity to engage with heritage and cultural sites, knowledge, and techniques, they may have never seen or used before. This exhibition provides youth and adults with a taste of public and private heritage and cultural sites, in which, they can visit at later dates to take in the educational experiences fully. In addition, organizations will showcase their missions, visions, programming, and projects to the public through the use of visual and/or oratory exhibitions. Knowledgeable individuals will also have the opportunity to showcase their individual research, cultural work, and craft to provide another perspective of learning to the next generation. In addition, some organizations will provide 45-minute presentations on local heritage and cultural topics in the Community Room of the Washington County-Jonesborough Library, 200 Sabin Drive, Jonesborough from 10 am to 4 pm. These include Anne G’Fellers Mason with the Heritage Alliance of Northeast Tennessee and Southwest Virginia, speaking on “Using Drama to Tell Your Story;” Langston Education & Arts Development (LEAD, INC.), speaking on “Brief History of Black Education in Johnson City and Washington County;” Deborah Webb with the Northeast Tennessee Community Help Center, speaking on “The Past, Present, and Future of the Northeast Tennessee Community Help Center;” Boones Creek Historical Trust; and others to be announced. 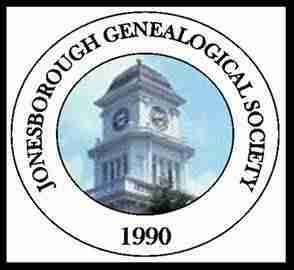 Furthermore, the Washington County-Jonesborough Library will be doing a demonstration of the new scanning systems in the library’s Genealogy and History Center. More information on this demonstration will be announced. Finally, the Living History Timeline, which will be presented in Mill Springs Park, 104 Spring Street, and Jimmy Neil Smith Storytelling Park, 111 W. College Street, will consist of tradespeople and reenactors in two particular time period-based camps from pre-Revolutionary to early 20th Century regalia. The Living History Timeline present educational experiences through the visual representation of life throughout history, which includes period clothing styles, language, techniques, and experiences. In addition, it provides a look at jobs and trades, as well as economic, social, racial, and gender stature throughout time. Beginning at the Jonesborough Visitors Center, partakers will move through time by walking the streets of Tennessee’s oldest town where they can view and learn about the town’s preservation efforts and past as well as delving into topics and experiences in the town’s historical façade with its storied-past telling its own story, creating an environment, combined with the other two parts, that sets local heritage and culture in motion, so students and the public can create, develop, and cultivate their own sense of community and place within the region as a whole. Beginning at 9 am at Mill Springs Park, participants will take part in six distinct stations of the Pre-Revolutionary to 1850s era, which will include the telling of the story of the Overmountain Men from Historical Interpreter, Steve Ricker, Programs Director of the Overmountain Victory Trail Association, at the Gazebo at Mill Springs Park; Jackie Fischer, Park Manager of David Crockett Birthplace, speaking on the role of women in Cherokee Culture; Kings Mountain Chapter of the Sons of the American Revolution’s period weapons tent; Starlet Williams, former historical interpreter of Ruth, the Cobb family’s cook, at Rocky Mount State Historic Site for 27 years, speaking on slave medicine; Doug Ledbetter, former president of the Nolichucky Chapter of the Overmountain Victory Trail Association, demonstrating colonial woodworking and history of the Nolichucky area during settlement; and Debra Thompson, demonstrating basket weaving techniques. Also beginning at 9 am at Jimmy Neil Smith Storytelling Park, participants will take part in six distinct stations of the Civil War to early 20th Century era, which will include Civil War Historians Michael and Elizabeth Baird Hardy, demonstrating, speaking, and presenting the military, civilian, and gender roles of the war within three stations; David and Matthew Simerly, father and son living historians, will present a station on the Importance of the Doughboy and WWI; the State of Franklin Chapter of the Daughters of the American Revolution will present the 19th Amendment and Women’s Suffrage Movement; and the Storytown Brigade will demonstrate oral history techniques and collect stories from the day’s experience of heritage and cultural explosion in Tennessee’s oldest town. In addition, other heritage sites will be open throughout town including the Washington County-Jonesborough Museum in the Jonesborough Visitors Center, 117 Boone Street; the Genealogy and History Center in the Washington County-Jonesborough Library, 200 Sabin Drive; the Chester Inn State Historic Site and Museum (116 W. Main Street) will open at 11 am and close at 6 pm; the Chuckey Depot Museum (2nd Avenue) will open at 1 pm and close at 5 pm; the McKinney Center at Booker T. Washington School (103 Franklin Avenue) will open at 8 am and close at 5 pm; and the Washington County Department of Records Management and Archives (103 W. Main Street) will open at 8 am and close at noon. Some events and schedules are tentative and could change, be added, or cancelled, please check back for up-to-date information. For more information on the Washington County Heritage Fair, please visit the Jonesborough Genealogical Society’s website at jgstn.org/annual-heritage-fair/ or facebook page www.facebook.com/tnjgs/ or visit the Jonesborough Visitors Center and Emporium at 117 Boone Street, Jonesborough or pick up a copy of the Jonesborough Herald and Tribune and read the update and answer the trivia question each Wednesday up to the fair.